The Royal Pet Resort is a very unique business in Paulding County. 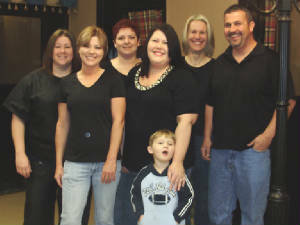 In fact, it is one of the most innovative pet resorts in the metro Atlanta area. Scott and Tammy Anderson, residents of Paulding County, did extensive research and have created a warm, yet ritzy facility to meet the animal lover's needs and far exceed expectations. The most exciting service the Royal Pet Resort has to offer is Luxury Boarding Suites. With these superior accommodations, you can get away and relax, knowing your pet is receiving the care, love, and attention he or she deserves. Each uniquely decorated 6'x8' suite is separate, private, and equipped with state of the art extras, including satellite television, airing the ever popular Animal Planet. As if that wasn't enough, check in on your pet via Internet Web Cameras 24/7, 365 days a year, from anywhere in the world. Each suite is part of a natural sunlight-skylight roof system and climate-controlled with HEPA filtered air. Your pet will enjoy comfortable rest on elevated, double-thick, fleece-lined Kuranda Beds and cool refreshing filtered water. All dogs are exercised outdoors four times a day, in a secure, fenced, two-acre area. Tours Available - Come in and have a look around! Tours are available anytime, during Normal Business Hours. And bring your four legged family member with you if you’d like! Hours of Operation are Monday through Friday, 8:30am to 5:00pm, Saturday. 9:00am to 5:00pm. For more information, to make a reservation, and/or to schedule an appointment, please call 770-439-4364. Be Sure to Sign Our Guestbook, Below! Your pet can enjoy these luxurious accommodations for only $35.00 per night. (and we know what you're thinking, sorry, four legged guests only!) $10.00 a night extra for each additional dog. 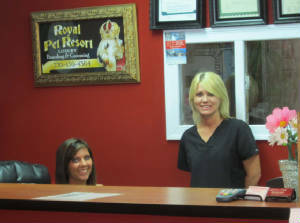 Other desirable services offered at Royal Pet Resort include full-service, professional grooming for your dog or cat. Each of the resort’s groomers have 16+ years experience and are available for appointments Monday through Thursday, 9:00am to 5:00pm and Saturdays 9:00am to 5:00pm. During your visit to the Royal Pet Resort, please be sure to shop for your pampered pet. Their Gift Boutique offers unique collars, clothing, treats, and other pet needs.